New Eye-Fi Cards Get Infinite Memory, Pretty Much | OhGizmo! Canon 60D, Rebel To Have Articulating Displays? I’m not quite sure how they do it, but Eye-Fi manages to keep on cramming feature after useful into their wireless memory cards. This time around, they’re introducing a new tier of card (above Pro), the Pro X2. It costs $150, but at least read about what it does before you scoff at the price… The X2 is an 8 gig SDHC card with a built-in 802.11n antenna. N! N means faster uploads at greater distances, so that’s definitely good. And more storage is good too. But the most useful feature of the X2 is the option to have the card delete pictures after it uploads them, giving you an infinite amount of memory (provided you’re near some source of WiFi) while sharing and backing up your pictures real time. The card won’t delete anything until it’s confirmed that the upload was successful, but hypothetically, you can just stop worrying about whether or not you’re running out of space when taking pictures (or videos). The X2 also comes with all the rest of the awesome Eye-Fi features, like RAW support, geotagging, ad-hoc WiFi connections, and Wayport WiFi access. Unfortunately, from what I can tell from the press release, the infinite memory option will be available on the new X2 cards only. This is a bit of a disappointment, since previous useful firmware upgrades were made available to all of the cards. But, I guess it’s probably somewhat unrealistic to expect to keep getting free goodies, and for you heavy shooters, the additional SDHC space and the potential for never having to worry about space again may make the X2 a worthwhile upgrade. 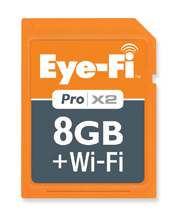 Look for the Eye-Fi X2 on Amazon and the Eye-Fi website. That is pretty impressive, I can't believe there is so little time between upgrades though. Kind of makes the market go, we'll just wait a bit till a better one comes out, and then no one buys it.